A best know for manufacturing Mother Board, a Taiwan based computer hardware producing company Gigabyte technology's website site has been hacked and defaced today by The TurkishAjan hacker group. There were totally four sub-domains of Gigabyte technology that have been defaced. Hackers have not mention any specific reason for attack. 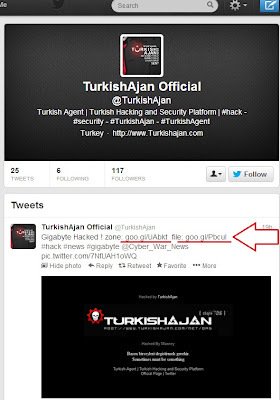 On the deface page they just wrote "Hacked by Hacked by TurkishAjan. Bazen birseyleri degistirmek gerekir. Sometimes must be something". The subdomains that are been hacked are listed below. Hackers have also posted the Gigabyte.rar file link on there official twitter account along with the zone-h mirror link. "Gigabyte Hacked ! zone: http://goo.gl/UAbkt file: http://goo.gl/PbcuI #hack #news #gigabyte" as written on twitter account. RAR file contains many of the employees details as like Full name, Email id's and plain text of passwords. Rar file is of size some thing 10.38 mb that was uploaded.